Blossom Meadow beeswax crayons are large, hard to break, and easy to grasp. We have combined pure beeswax and high-quality, non-toxic artist pigments to make natural crayons with extraordinary color brilliancy and opacity. 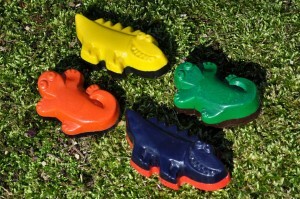 Our crayons are hand-poured in the shapes of alligators and salamanders (a four pack includes two of each animal). Each crayon is layered with two colors and weighs approximately 2 ounces. The alligators measure 1 by 4 inches and salamanders measure 1 by 3 inches. Each package includes all eight colors: orange/purple; blue/red; green/brown; and, yellow/black. While major crayon brands use paraffin wax (a petroleum byproduct), little bees make the wax we use. Because they are made from 100% beeswax, they smell like beeswax and honey!